Skopec says the algae releases dangerous toxins. “The toxins can affect the liver as well as the nervous system. In the most extreme they can cause respiratory distress. Often times we see issues with nausea or diarrhea, headache, that kind of thing,” according to Skopec. “So, it can make people quite ill — and it has in isolated cases caused pet deaths deaths, dog deaths around the state.” She says avoid drinking the water in those areas or putting your head under the water in those areas. The DNR says a “substantial” fish kill on Crystal Lake seven miles west of Forest City in Hancock County is linked to an algae bloom over the Fourth of July weekend. Three lakes — Black Hawk, Pine Lake, Twin Lake — have advisory signs posted after DNR testing showed issues with blue-green algae. In addition, testing showed relatively high levels of toxin for clear water on Lake Geode, Lake of Three Fires, and Green Valley — though those lakes didn’t have signs of algae blooms. Some Iowa beaches also have signs posted for high-levels of bacteria this week: Backbone Lake, Denison Beach on Black Hawk Lake, Lake Geode, Lake Macbride, Pine Lake, and Union Grove Lake. 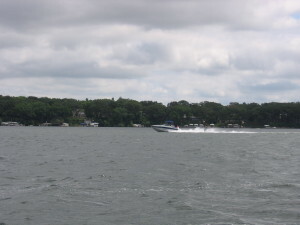 While Iowa waters have issues with bacteria and algae blooms, a 14-year-old boy died this week after being infected by an amoeba after swimming in a Minnesota lake. Skopec says the amoeba is not a major concern here. “At this point I wouldn’t be too worried about it, because it’s a very isolated condition,” Skopec says. She says the amoeba that causes the problem likes specific water conditions. The amoeba enters the brain through the nose. Skopec says again, if you avoid drinking water with any of these issues and don’t put your head under the water, you should be okay. You can find out more about the beach water monitoring program at: www.iowadnr.gov.